Our typically french cottage dates back to the 16th century and enjoys panoramic views over the chateau of Villebois Lavalette in the Charente to the front and the beautiful countryside of the Dordogne to the rear - you are, therefore, ideally located to explore both these departments during your stay. The cottage sits in the 1.5 acre grounds of the original farmhouse and, whilst it is attached to the farmhouse, it is separated by a courtyard wall which provides you with privacy but the owners are on hand to deal with any problems should they arise. The property is fully fenced and so your children and/or dogs are safe to roam freely. The cottage itself has all the charm you would expect of a building of this age with its 2 foot thick walls to keep the interior cool when the sun outside gets too much to the large Charentaise fireplace with log burner to keep you warm if the evenings get chilly. Cornflower blue shutters, a climbing rose over the door and aromatic honeysuckle climbing the walls complete the rustic chocolate box charm. The cottage can comfortably accommodate 2 adults and a child and there is a sofa bed downstairs for an extra two adults if required. We are also able to put in a second single bed upstairs and a full size cot if required. The large bedroom has a hanging divider between the double and single bed to afford a small amount of privacy if required. The cottage comes with exclusive use of the heated in ground 8m x 4m swimming pool (May to September) which also benefits from the stunning views to the chateau and has a covered seating area to escape to if the sun gets too much. To the rear of the cottage is a stone built barbecue with patio and seating area which enjoys the view over the Dordogne. At night, sit outside and enjoy the spectacle of brilliant stars that puncture the inky blackness of the sky, the likes of which you will only get when away from the hustle and bustle of city lights. When you are ready to leave the tranquility of your holiday base you are ideally situated to visit the many famous attractions of the area. Villebois Lavalette with its chateau, Saturday morning market, boulangeries, restaurant and bar is only 5 minutes drive away. Angouleme (capital of the Charente) , Brantome (Venice of the Perigord) and Aubeterre-sur-Dronne (officially one of the most beautiful villages in France) are all within 40 minutes drive. For those looking for activities, there is a zip wire park, golf, tennis, river beaches, canoeing, a water park, laser quest and much more within easy reach for a day out. But, if you are just looking to kick back and relax, then set yourself up by the pool or on one of the patios outside the cottage and just take in the views which change throughout the day as the light changes culminating in a truly stunning evening sunset - all with a glass of your favourite tipple in hand - what could be better - ENJOY!! Dave & Wendy moved to France with their two dogs when Dave retired last year. It was a fairly snap decision but one we have certainly not regretted at all. We love the slower pace of life and enjoy pottering around our property, improving it as we go. We are very proud of how we have brought the farmhouse back to life and would very much like to share our beautiful location with you - you will feel like you are truly sitting on top of the world. You really need to come to truly appreciate to beauty of our location - we feel we have not yet managed to take any photo that does it proper justice but all our visitors have been blown away with the breathtaking views and the magnificent sunsets you are able to enjoy due to our elevated situation. The night sky on a clear night is full of the brightest stars and the peace you will experience is verging on spiritual. But don't take our word for it - come and find out for yourselves. We are ideally placed to drop into the Dordogne with its beautiful countryside and picturesque villages or you can travel 30minutes up the road to the capital at Angouleme if you want to dip into the city environment for a day with its numerous bars, restaurants, shops and museums. Alternatively, drive across country to the vineyards around Cognac etc if you fancy a day wine or Pineau tasting. We have many famous tourist attractions within 30-40 minutes drive away, not to mention the fairytale style chateau down the road in Villebois Lavalette which you can also see from your cottage or pool. Thank you so much Wendy and Dave we had an wonderful relaxing holiday at your beautiful gite it was the most gorgeous setting and you were both very warm and welcoming. We have come home very relaxed and recharged. Also The lovely Archie and Eric are just wonderful characters and great dogs and jasper could have stayed another week with them as could we. Thank you very much we will definitely return Fiona, Keith, John and Jasper. Gite was a lot larger than we expected and was plenty big enough for our family of four. The pool was briliiant with great views for miles and there were local amenities within 5 mins drive. Dave and Wendy were great hosts, they’re very relaxed and extremely welcoming. Despite being right next door we had so much privacy for the 11 nights we were there, it was amazing. Thanks again guys, we will be back. This was one of the best holidays we have had. 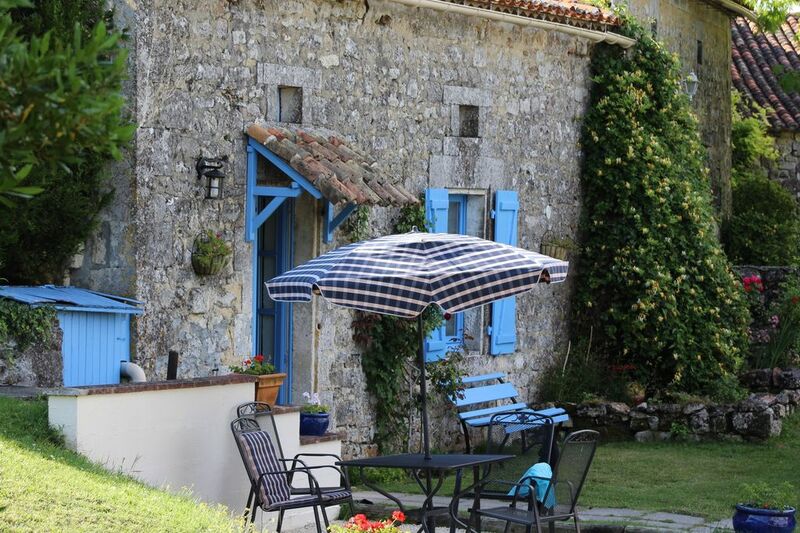 The gite is full of charm and is really well equipped. The welcome pack on arrival was fabulous, and even included eggs from Dave and Wendy's own chickens. There is a wonderful BBQ area at the back of the property and the pool is amazing, not to mention the panoramic views and the incredible sunrises and sunsets. Dave and Wendy were so hospitable and we loved their two dogs. Overall, a perfect holiday which we would thoroughly recommend. The property exceeded our expectations. It is a gorgeous little hidden gem with a private pool. We thoroughly enjoyed our stay with our 6 month old son and two dogs. The property exceeded our expectations from photographs and the private pool was a fantastic bonus. Dave and Wendy provided us with everything we could have wished for for our holiday (including making sure we were ok during a thunderstorm!) The views from the property are phenomenal and we thoroughly enjoyed spending many nights watching the sun set with a cold beer in hand. The property is well located for exploring this part of France, but is also a fantastic place to spend a day just chilling out by the pool. The dogs appreciated the cool space of the downstairs during the day if the weather got too hot. Dave and Wendy were incredibly friendly and always happy to help if we needed it. Great time. Dave and Wendy are wonderful hosts. The welcome was exceptional and much appreciated. The pool was very well kept and at a good temperature. Also, our little cocker spaniel enjoyed running around the well fenced gardens with Archie and Eric (the owners' dogs). Gite was perfect - could not fault it in any way. Really enjoyed our stay and looking forward to our next visit. Wendy and Dave are very good hosts, living next door,and nothing was too much trouble for them. We were their first clients of 2018 and there was good welcome pack for which we were grateful. Dave provided logs for the wood burning stove which sadly we needed to use - a chilly week in April. The property benefits from great views both from the front and rear and I am sure would be a good place to stay particularly in the summer.